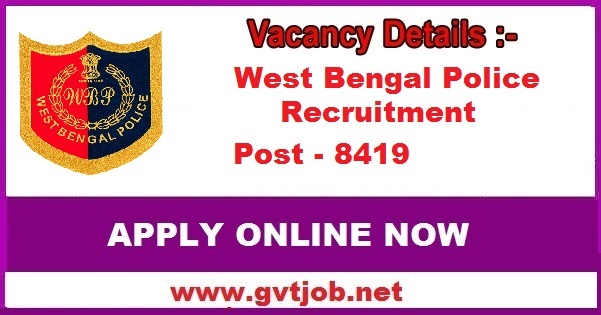 There are many posts to be recruited in West Bengal Police. Please tell you that these recruitments are going to be held on 8419 posts for constable posts. Let us know that the applications have not started yet. In order to apply for these posts the educational qualification of the candidates is determined according to the post. To apply for the above positions, the age limit of candidates has been fixed at 18 years to 27 years. To apply for the posts of the constable, look at the release issued by the candidate West Bengal and complete the application process accordingly. Candidates can apply to these positions by March 05, 2019. For unreserved candidates, Rs, 150 / - (West Bengal) and for all other candidates Rs 20 / - application fees will be payable. See the notification for more information. Age limit for Constable (male) posts has been fixed at 18 years to 27 years. Selection Process: The initial examination will be conducted by PMT and PET, then the main written examination, after which there will be document verification and medical examination. Online/offline applications will be accepted on these posts. To apply the application, go to the respective website and complete the online application process as per the existing guidelines. Click here to learn at the official website. Click here for more information related to the application.